Cadiz, the seat of Trigg county, is located near the center of the county on the Little River and US 68. The area was settled late in the eighteenth century and the town was established in 1820 to provide the county seat, although it was not immediately accepted as such. The origin of the name is obscure. Cadiz was incorporated in 1822. The Cadiz post office opened in 1821. The population in 2010 was 2,558. The Cadiz Railroad began operating in 1902, primarily hauling tobacco, but also other freight and passengers. It was originally 10 miles long – from Cadiz to Gracey where it connected with the Illinois Central – but was extended to Princeton in 1984. The entire line was abandoned in 1985. 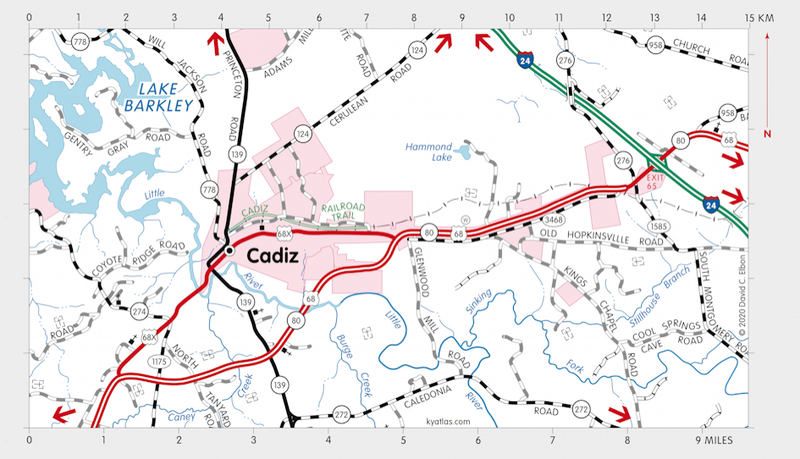 About 2.5 miles of the old Cadiz Railroad right-of-way in Cadiz has been converted to the Cadiz Railroad Trail. 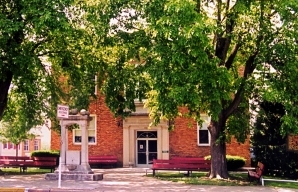 The sixth Trigg County Courthouse in Cadiz was completed in 1922. It was razed in 2008 and a much larger building was constructed at the same location.